This time of year, goblins and ghouls are in plentiful supply. 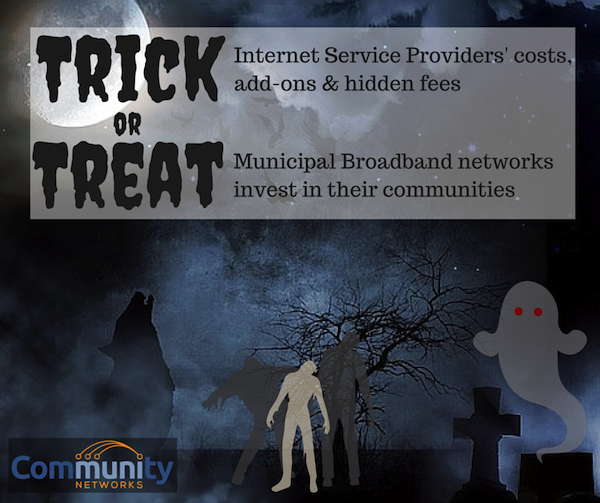 There is, however, a much scarier prospect than kids in rubber masks and bad Halloween candy: the reality of our monopolistic internet service providers. Enjoy the following images designed for Halloween and feel free to distribute widely. Fiber is not a new commodity in Santa Cruz. Since 2011, Cruzio has installed fiber in several of its projects, and the fiber has wooed some 30 entrepreneurs and solo practitioners to stay in the downtown area at the Cruzio Works, a co-working space. Last November, Central Coast Broadband Consortium commissioned a study of the fiber networks in Santa Cruz (paid for with a grant from the California Public Utilities commission). They discovered more fiber under the city of Santa Cruz than in any other city in the counties of Santa Cruz, Monterey, and San Benito. 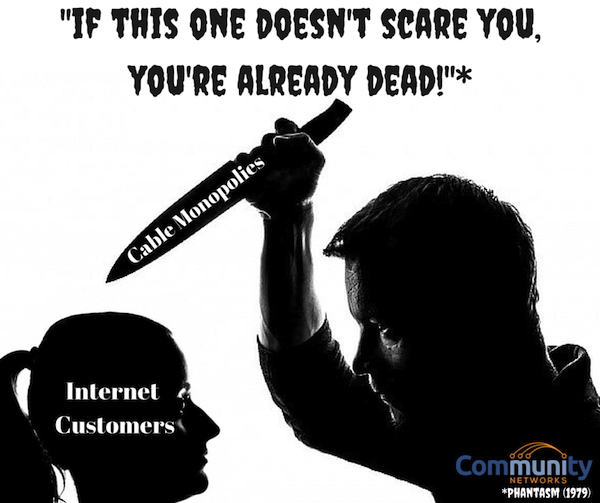 Unfortunately much of it belonged to incumbent providers like Comcast and AT&T who are loath to lease dark fiber or make affordable fiber connections available to local businesses and residents. As of this January, the FCC defines broadband as 25 Mbps downstream and 3 Mbps upstream, but in some rural areas in the United States, people are still struggling to access DSL speeds of 768 kbps. In a few extreme cases, individuals who rely on the Internet for their jobs and livelihoods have been denied access completely. The sad state of affairs for many Americans who subscribe to the major Internet service providers like AT&T and CenturyLink was recently chronicled in an article on Ars Technica that examined AT&T’s stunning combination of poor customer service, insufficient infrastructure, and empty promises to subscribers. It tells the unfortunately common story of the little guy being systematically overlooked by a massive corporation focused solely on short-term profit maximization. Mark Lewis of Winterville, Georgia, and Matthew Abernathy of Smyrna, Tennessee, are two examples of AT&T subscribers who, upon moving into new homes, found that not only were they unable to access basic DSL speeds, but that they had no Internet access whatsoever. Alternatively citing a lack of DSL ports and insufficient bandwidth, AT&T failed to provide Lewis Internet access over the course of nearly two years. As for Abernathy, the corporation strung him along for 9 months without providing DSL, forcing him and his wife to rely on a much more expensive Verizon cellular network to go online. The Open Technology Institute (OTI) at the New America Foundation recently released its report on bandwidth caps. "Artificial Scarcity: How Data Caps Harm Consumers and Innovation" is the latest warning about an issue with grave implications. The PDF is now available to download. Last November, the Government Accounting Office (GAO) released a report [PDF] with serious comments on how ISPs might abuse their power through bandwidth caps. In that report, the GAO strongly suggested the FCC take action. This report by Danielle Kehl and Patrick Lucey further examines how this profit grabbing technique from the big ISPs impacts consumer decisions and usage. In this paper, we examine the growth and impact of usage-based pricing and data caps on wired and mobile broadband services in the United States. We analyze the financial incentive that Internet service providers (ISPs) have to implement these usage limits and discuss research that demonstrates how these policies affect consumer behavior. In particular, we explain how data caps can make it harder for consumers to make informed choices; decrease the adoption and use of existing and new online services; and undermine online security. It is also increasingly clear that data caps have a disproportionate impact on low-income and minority populations as well as groups like telecommuters and students. In the conclusion, we urge the Federal Communications Commission (FCC), particularly as the new Open Internet Order goes into effect, to open up a serious inquiry into whether data caps are an acceptable business practice. In addition to their own data and conclusions, Kehl and Lucey provide information to many other resources that tackle the implications of bandwidth caps. As consumers' need for bandwidth increases with their changing Internet habits, this topic will only become more pressing. For some five years now, many have been talking about gigabit Internet access speeds. After arguing for years that no one needed higher capacity connections, Comcast has finally unveiled its new fiber optic option. And as Tech Dirt notes, it is marketed as being twice as fast but costs 4x as much (even more in the first year!). We decided to compare the Comcast offering to muni fiber gigabit options. For more information on the great offer from Sandy, see the video we just released about their approach. Funny or Die offers up a new video, If Everything Was Bundled Like Cable, starring David Koechner. None of us like paying for stuff we don't use, and television channels are no exception. Here are some examples of that same model as it applies to other everyday activities. "I don't like your way! Fix it!" Longmont's NextLight Offers Businesses, Residents Third Fastest Internet In the U.S.
Ookla finds the third fastest Internet access in the U.S. is located in Longmont, Colorado, reports the Times Call. NextLight, Longmont's gigabit municipal fiber network, is the source of the increase in speeds, driving Longmont's Internet access speeds far beyond any other service in the state. Ookla clocks average download speed in Longmont as 105 Mbps, which includes all providers in the community. 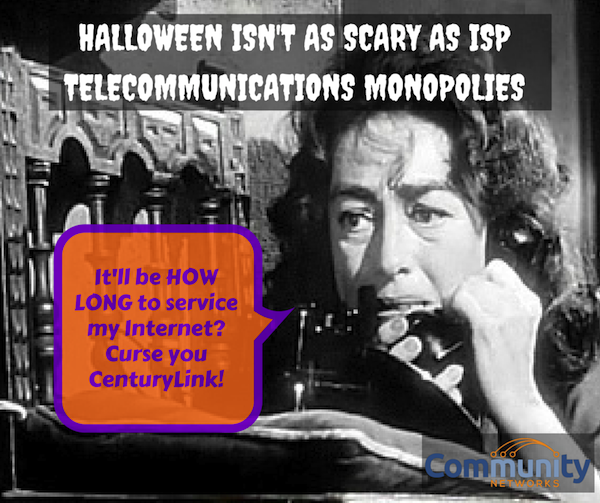 Incumbents Comcast and CenturyLink are dragging down NextLight's average download speed of 221 Mbps. Statewide, Colorado's average is 40 Mbps. Ookla shows Internet speeds in Longmont shooting up in January and February, when LPC crews began hooking up customers to NextLight in earnest. NextLight continues to attract residential and business customers. In February, NextLight announced it would be hiring more install crews to meet the high demand for connections. Places without the speed, affordability, and reliability NextLight can offer will find themselves at a disadvantage as economic development increasingly relies on next-generation networks. In the aftermath of the Comcast/TWC merger being effectively denied by the Department of Justice and Federal Communications Commission, we thought it was a key moment to focus on antitrust/anti-monopoly policy in DC. To discuss this topic, we talk this week with Teddy Downey, Executive Editor and CEO of the Capitol Forum as well as Sally Hubbard, Capitol Forum senior correspondent and expert on antitrust. We start off with the basics of why the Comcast takeover of Time Warner Cable posed a problem that regulators were concerned with. 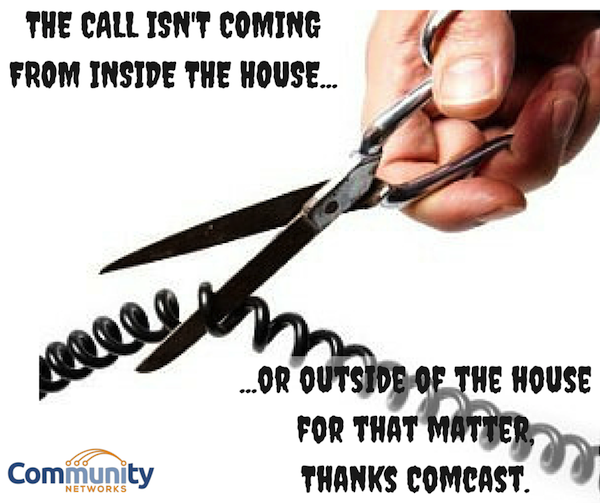 From there, we talk more about the cable industry and whether other mergers will similarly alarm regulators. We end with a short discussion of what states can do to crack down on monopolies and the abuse of market power. Along the way, we discuss whether DC is entering a new era of antimonopoly policy or whether this merger was just uniquely troubling. We learned about Teddy and Sally from Barry Lynn at the New America Foundation, who we had previously interviewed for one of my favorite shows, episode 83. Read the transcript from our discussion with Sally and Teddy here.